We were out in the wilds, heading south-west into that part of Norfolk that is the edge of the Brecklands, where the soil is sandy and the fields are rolling. We had left civilisation behind at Great Ellingham, and the lanes that carried us away were long and straight, cutting through the emptiness. Ahead, we could see the twin sentinels of ruinous Rockland St Andrew's split tower. It was easy to understand why it had been abandoned; it is so lonely out here. We had not passed a building for a mile or more, and we were still a mile short of Rockland village. But the ruin of St Andrew is not alone up here on the ridge, for just a few hundred metres further west is the parish church of Rockland All Saints. What a contrast. As we approached All Saints, the wild hedgerows gave way to trim verges, mown within an inch of their lives. The wild flowers didn't stand a chance. It was something of a relief to see that the moles, at least, were holding out; their soft mounds scattered along the side of the road at irregular intervals. And yet there were no other buildings in sight, no cars or people. Who, or what, had tried to transform this country lane into municipal suburbia? We reached All Saints church, and the contrast with the ruin was complete. 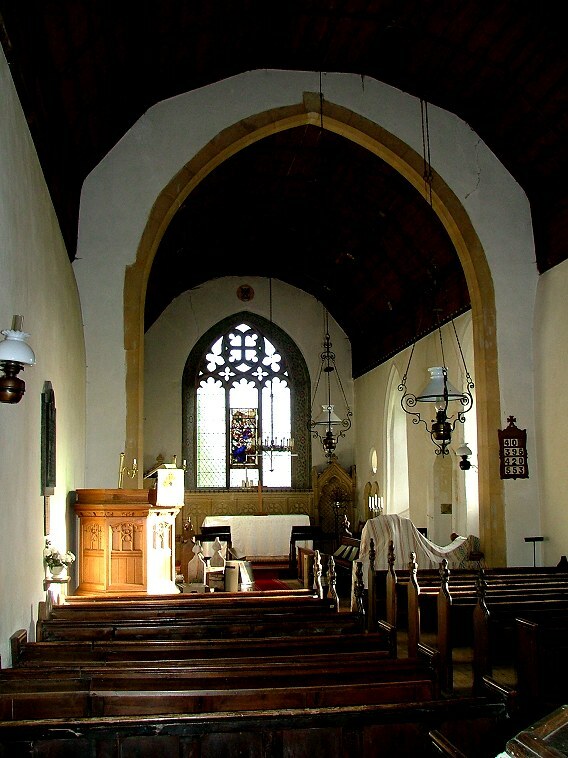 Although it is in the middle of nowhere, All Saints appears stunningly well looked after, as if it was in the middle of a puritan town in New England. There's a small outbuilding on the edge of the graveyard beside the road, but apart from that and the ruin there wasn't anything else for miles. The clean lines of the building are crisp and restored. Even the tower is cropped severely, without battlements or spirelets. The gravestones are rearranged in neat rows, and the grass of the churchyard was like a bowling green. As we approached, a deer broke from near the trees at the edge of the graveyard and headed off across the open field beyond, and some rabbits fled from the west end of the church. Quite what they had found to eat in the graveyard is beyond me. Maybe they had just come to stare in amazement at nature so severely tamed. We wandered around the church, and found that on the north side there was not a single window at all. On this bright sunny day, the shadowed cold of this side increased the contrast with the south. It was as if we had stepped behind a film set; but even here, the grass was closely mown. We came back to the sunny side and tried the door, but of course it was locked. I don't know why I was so sure that it would be; perhaps it was something to do with the way that wild nature was under the cosh here. It felt as if someone, or something, was in charge, in possession. 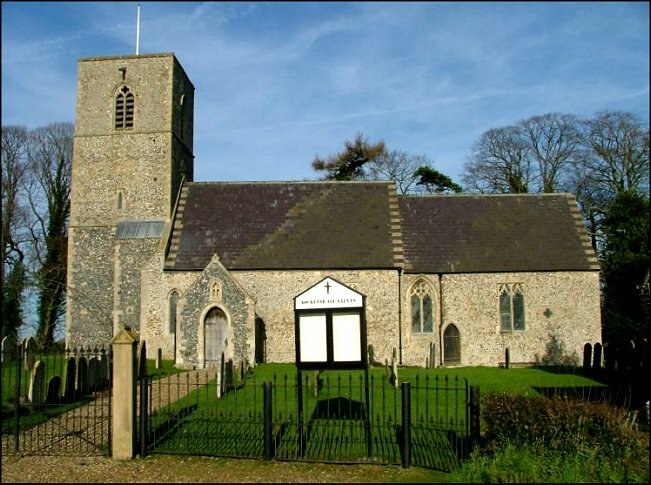 In this part of Norfolk it is actually unusual to find an inaccessible church, but there were no keys indicated here on the sign by the church gates or on the porch door. Indeed, the brightly painted notice board below the sign was completely empty. Peter hadn't seen a keyholder notice on his two previous visits, and four other people I asked who'd tried to visit in the previous year had also been unable to find one. 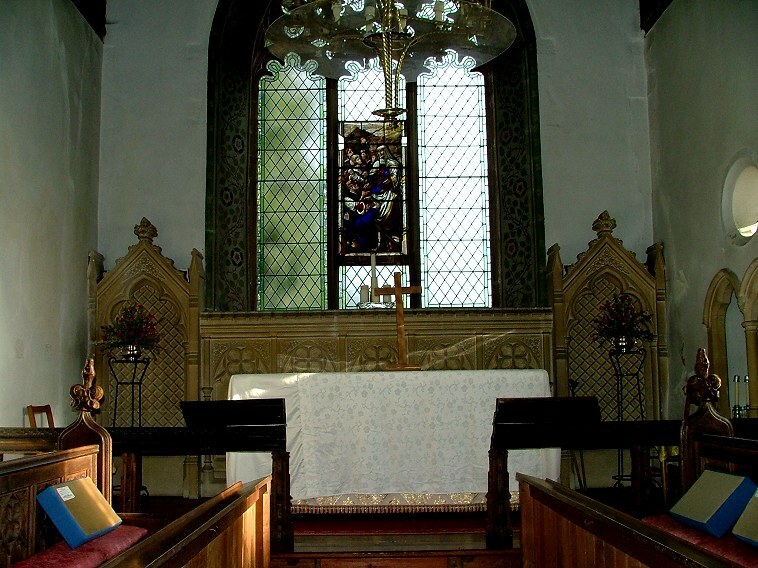 We came back to the church, and peered through the window at a tidy, Victorianised interior. It didn't seem as if we were missing much, being locked out. I was all for heading on; in January, the days are too short to spend hunting for keys. But although there was no keyholder listed, Peter Stephens had met someone cutting back the undergrowth at the neighbouring church of Rockland St Peter the previous summer who had told him where the churchwarden of All Saints lived. On that occasion, he had found the house, but the people had been out. He could remember where it was, so we decided to give them a visit, and see if a key was a possibility. Now, I know that I can occasionally be waspish, but Peter is the very model of politeness and gentlemanly conduct. It wasn't just laziness that made me stay in the car while he went and asked for the key. Peter is the kind of person you automatically trust. But the first response was not encouraging. "Why? Are you a bellringer?" asked the lady unpacking her car. 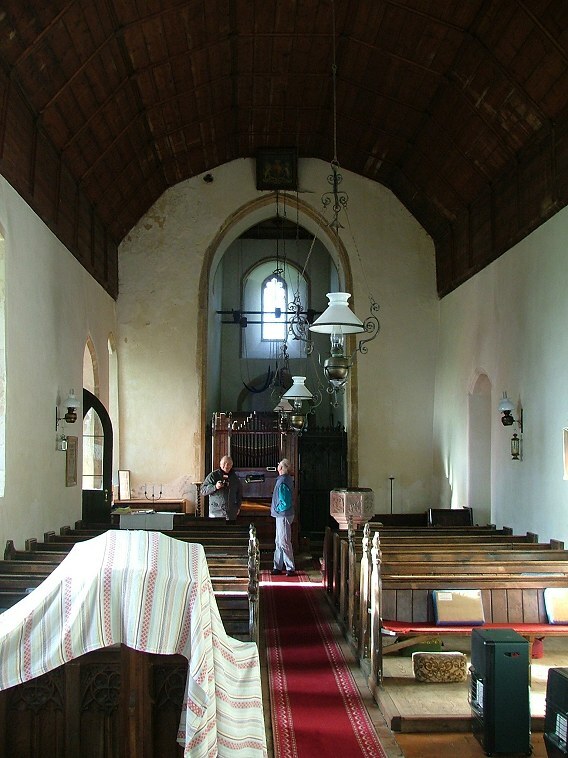 Peter had to admit that no, he wasn't a bellringer, but he would like to see inside All Saints. "Why?" the question came again. "We can't just let anyone inside the church you know." To cut a long story short, the lady called her husband and when Peter came back to the car he brought the churchwarden with him. The man was very pleasant, and I was grateful that he was willing to make the effort, especially as it turned out that they had only just just got back from holiday. But it always makes me feel as if I am not being trusted when the keyholder insists on accompanying me. Fortunately, this doesn't happen very often. We drove back to the church. "My goodness, look at all those mole hills", said our passenger, tutting in exasperation as we reached the incongruous neatly trimmed verges. We parked, and he pointed out that the small building on the edge of the graveyard was actually a National School of 1851. It is now used for storage, and there is a later 19th century school in the middle of the village; but, he told us, it was last used as a school during the Second World War for children evacuated from the East End of London. He unlocked the porch, and we stepped through and into the church. You'll not be surprised to learn that it was immaculate, looking every inch its major restoration of about 1880 - although, in fact, much of the woodwork is old, heavy varnish disguising its age. 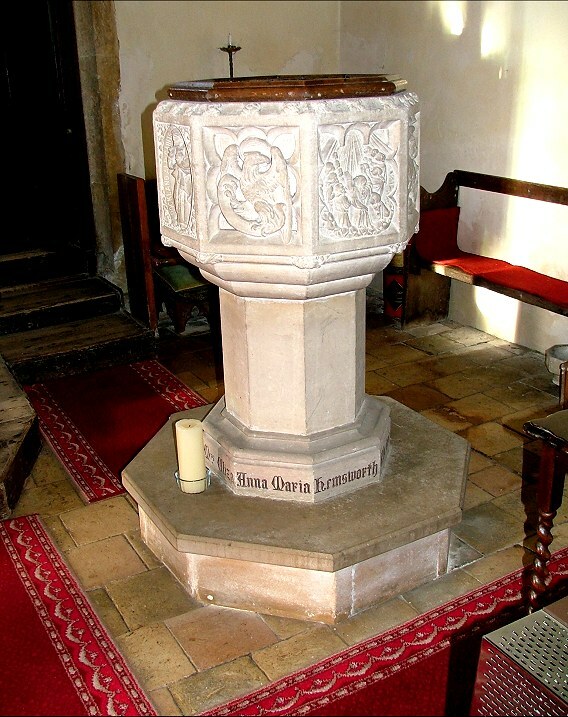 The font, which also dates from the 1880s, is outstanding of its kind; the dedication is to Maria Hemsworth, and the overall style is late 15th century; but the reliefs are full of Victorian piety and sentimentality. 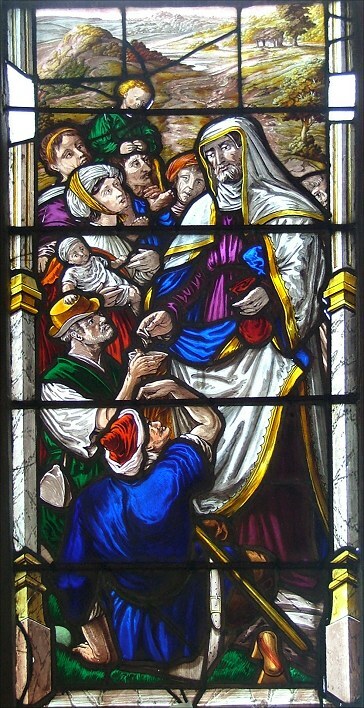 This piety is echoed in the single subject in the east window, a rich man dispensing alms. At first, I thought it was old continental glass, but on closer inspection it is a 19th century stab in the same style. The reredos below is very grand, the triumphalism of it rather ill at ease with the window, each making the other appear rather smug. Pevsner reports a Saxon coffin lid and the bowl of a Norman font, but I could not see either - perhaps they had been tidied away. 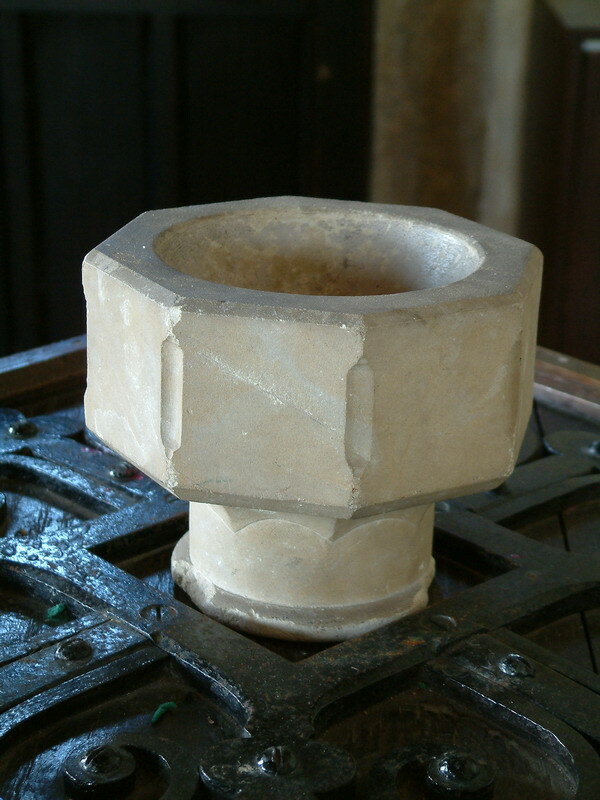 Chris Harrison tells me that he saw the Norman font on his visit to the church in April 2005, tucked behind the ends of the pews. Chris tells me that it is actually by no means certain that the bowl is Norman - or, indeed, that it is even a font at all. 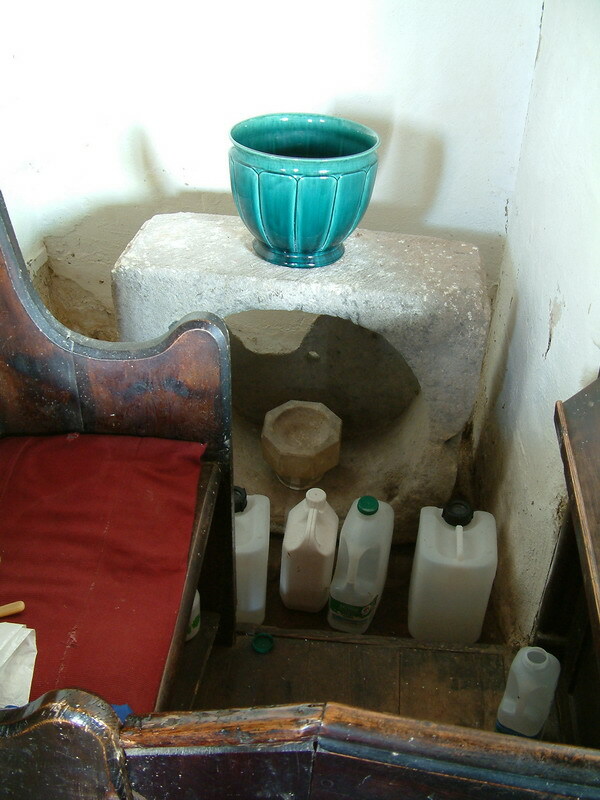 He also saw what appears to be a Victorian portable font, which the church retains. This little bowl would be used by a Priest when he baptised in a private house, a not uncommon occurence in the 19th century. Again, it is not impossible that this particular example is actually a holy water stoup from a pillar. So, Rockland All Saints is a church that has either one, two or possibly three fonts! Chris's photographs are on the right. Our companion chatted cheerfully to us as we photographed the interior, but was a little doubtful when I had a go at the royal arms high up above the tower arch, because there was a cobweb beside it. I assured him that I would have a go at airbrushing it out. The royal arms is interesting, because it is quite possibly the worst set in England. It was obviously produced locally, and the paint has run, either with damp or because it was hung vertically before the paint had dried, I don't know. 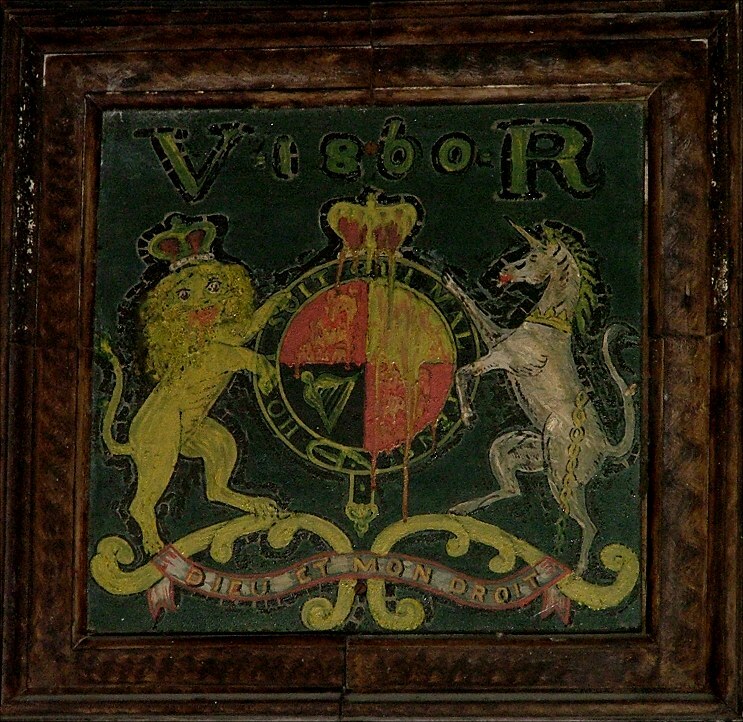 The date on it, 1870, is only a decade before the restoration of the interior, but it is curious that it is such poor quality when the font below it is so fine. Perhaps they just didn't like Queen Victoria very much around here. We saw everything there was to see. It didn't take long, and we were soon heading back to the village. We dropped off the churchwarden, thanking him profusely, and headed on to the blessed and accessible relief of Rockland St Peter. It only occured to me later to wonder why All Saints is kept locked without a keyholder. Never believe anyone who tells you that most churches are kept locked. They aren't. In Norfolk, perhaps 60% of churches are open everyday, and most of the rest have a friendly keyholder notice. But there are still a small number that are locked with no available keys. Some churchwardens follow this course because they fear having the contents of the church stolen; but there is nothing of value in All Saints. Others are afraid of casual vandalism, which would not be unreasonable here given how remote the church here is; but a keyholder is usually at hand to allow visitors who just want to a look or a pray. 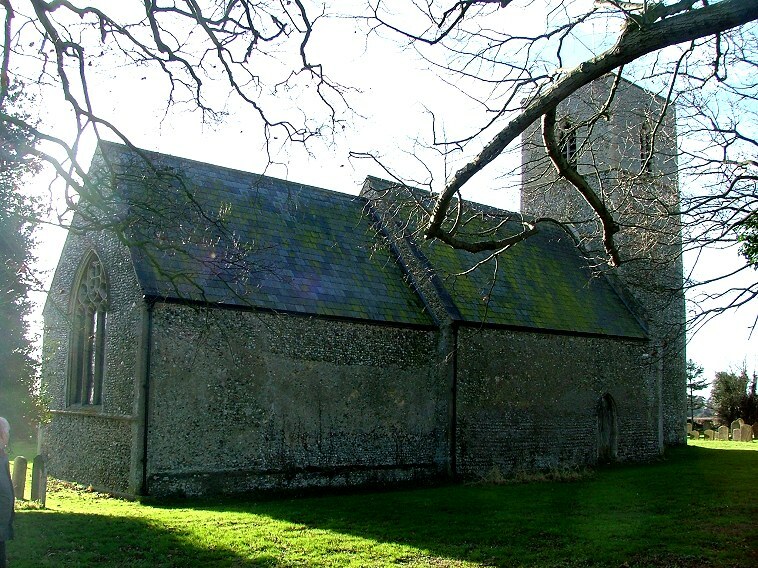 There are a few Norfolk churches which are kept locked as a theological statement, to impress on the Parish, and outsiders, that the Rector thinks that the 'Church' is not a building, but the body of believers; or, at least, those who bother to tip up on a Sunday. I guessed that none of these applied to All Saints, but perhaps that this is the only church in Norfolk which is left locked simply to keep it tidy. .. trim verges, mown within an inch of their lives. 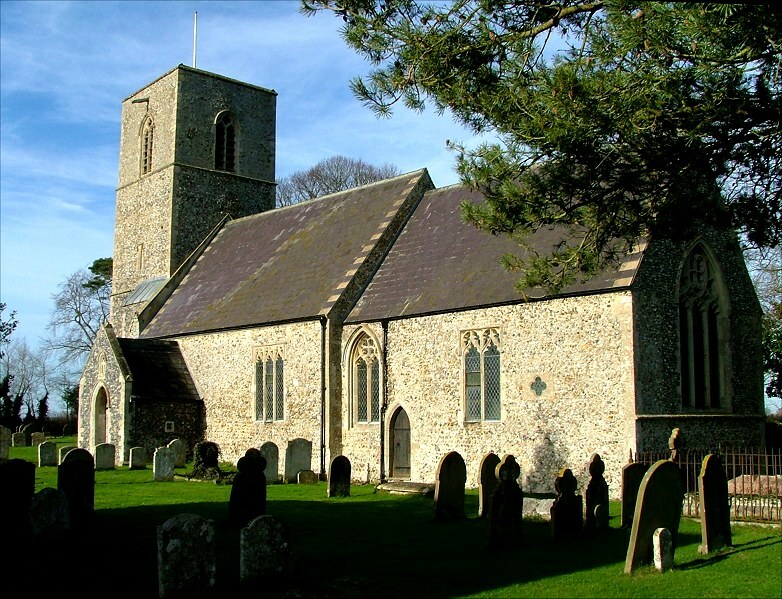 The verges are the only place on which the congregation and visitors can park their cars. If the hedges/verges are not cut the whole area would be overgrown with brambles. ...wild flowers didnt stand a chance. Its a pity that you and your colleague did not properly look round the churchyard and see the three wild flower areas that are uncut and extended each year. ...the gravestones are rearranged. Not so, they have always been as seen. ...nature so severely tamed. See above, plus at least it shows that we CARE about the state of the churchyard. C.f.cutting back the undergrowth that our friends at St Peters were observed by yourselves to be carrying out, presumably with your implicit approval . ...signboard was completely empty. This was because the noticeboard had only just been repaired (while we were away on holiday), due to vandalism. The keyholder notice was put back immediately after your visit. ...kind of person you automatically trust. With no introduction other than wishing to take photographs in the church, and our experience of three break-ins thus losing 16th century plate and antique desks, I feel we were at least justified in being cautious. Presumably if we had not accompanied you to the church we would have been castigated for allowing complete strangers to drive off with the church key. Not so. They are in easy view. .See above comments re break-ins and stolen items. Plus your definition of value may not correspond to that of our congregation. 60% of churches are open. Ergo 40% are not. General: It seems to me that All Saints has had to bear the brunt of you dislike of tidy churchyards, and any church that is locked ( for whatever reason). I feel that such comments are more appropriately placed in a general comments section and not aimed at one church." - John Scase, churchwarden.